This is yet another soup recipe from the Moosewood New Classics cookbook. I thought Clare would really like it because it called for soy sausage. I used our favorite – Morningstar sausage crumbles. It also called for greens, like swiss chard, kale, or collard greens. I chose kale. We don’t eat kale very often, so I wasn’t sure how good it would be, but it turned out great. It was quite spicy, and had plenty of flavor. This entry was posted in cooking and tagged sausage, soup. Bookmark the permalink. KALE! I have been perusing your blog. I am very much a newbie to this whole WordPress.org thing. Of course it’s driving me quite mad! I’ve been with Google forever. Well, they made the executive decision not to support FTP clients any longer – so I had to find a new home for my blog. Anyhow, I’ve just arrived on WP.org, have selected a template and now I’m trying to learn how to function in it AND make things appear the way I want them to appear. A daunting task. Like you, I LOVE TO COOK! If you peek at my blog you will see I have just started to add some of the recipes that are staples at our house. What I’m not happy with, and cannot for the life of me figure out – is how to make each of my recipes a little sub category under RECIPES. The way it is now, all my recipes open up at once and one can scroll from top to bottom. Not an easy way to pick the recipe one is interested in. I did download your category collapser … but I couldn’t find it on my site. No idea where it went. Admin said it was activated, but I couldn’t see it. It is probably quite apparent to you at this point that I know absolutely nothing about code … and no matter how much effort I put in to learning it … I just get a headache. Twenty or thirty years ago … maybe. Ah KALE! Yes. I just discovered Kale and I am quite besotted with it. What a wonderful addition to soup! 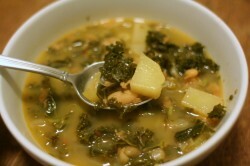 Do try that Portuguese Winter soup I’ve put on my blog. I found the recipe in Chatelaine magazine. Love it! One of the gals on the Chatelaine forum told me about another recipe for Massaged Kale Salad. She says it’s fabulous. I have it on my blog and you can take a look and see if it’s something you would like to make. In the meantime … I’ll try to figure out how to make changes to my tarimon-notse template. Now I’m going to get the ingredients for your curried spinach soup! After you have activated collapsing categories, there will be a widget called collapsing categories which you can drag into your sidebar. Have fun learning wordpress, and glad you like my recipes.